A biopsy is a test of tissue from the body. A lab will check the sample to see if there is something unusual about it. You may need this done to diagnose or find out more about a problem. It may also be done to find out if there is cancer. Smoking may raise the risk of problems. Be sure to talk with your doctor about these risks. Talk to your doctor about your medicines. You may be asked to stop taking some medicine. Do not eat or drink after midnight if you will have general anesthesia. General anesthesia—given through an IV to block pain and keep you asleep. Local anesthesia—will numb the area. More common when tissue is taken from the skin. 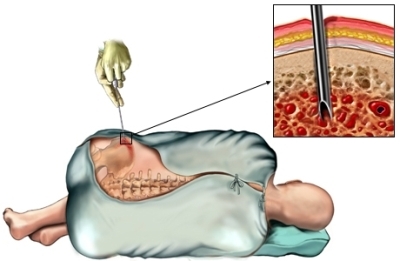 Punch biopsy —a sample with many layers of skin is removed with a special tool. A simple biopsy should only take a few minutes. It will take longer during a surgery. You may have pain. Ask your doctor about medicine to help with the pain. You will be able to go home after a simple biopsy. If you had surgery, you may need to stay for 1-2 days. Biopsy. Radiological Society of North America Radiology Info website. Available at: http://www.radiologyinfo.org/en/submenu.cfm?pg=biop. Accessed March 14, 2018. Schoonjans JM, Brem RF. Fourteen-gauge ultrasonographically guided core-needle biopsy of breast masses. J Ultrasound Med. 2001;20(9):967-972. 6/3/2011 DynaMed Plus Systematic Literature Surveillance http://www.dynamed.com/topics/dmp~AN~T905141/Treatment-for-tobacco-use : Mills E, Eyawo O, Lockhart I, Kelly S, Wu P, Ebbert JO. Smoking cessation reduces postoperative complications: a systematic review and meta-analysis. Am J Med. 2011;124(2):144-154.